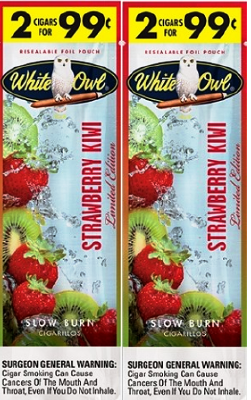 White Owl Cigarillos Strawberry Kiwi are a delicious new flavor from America’s favorite brand. Utilizing only premium tobaccos then infused with the fruity essence of refreshing strawberries and kiwis, these cigarillos are delicious and aromatic. They are individually packaged in foil pouches for maximum freshness. White Owl Cigarillos Strawberry Kiwi are the perfect mild bodied smoke to enjoy any time of day. White Owl is a classic cigar that’s rich in history, dating back to 1887. White Owl cigars are machine made in Dothan, Alabama, U.S.A. with a sheet-type wrapper and binder that encases a mixed filler tobacco blend from five nations which give an extra smoothness and fine taste.